The fourth edition of The Cytokine Handbook provides an encyclopedic coverage of the molecules that induce and regulate immune responses. 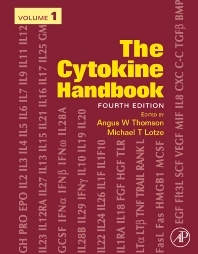 Now expanded to two volumes, co-edited by Michael T Lotze, and written by over 120 international experts, the scope of the book has been broadened to include a major emphasis on the clinical applications of cytokines. The early chapters discuss individual cytokines, chemokines and receptors. Additional chapters discuss the clinical implications and applications of cytokines, including cytokine gene transfer, antisense therapy and assay systems. This book is essential for researchers and clinicians interested in cytokines, including anyone working in cancer biology, transplantation, infectious diseases, autoimmunity or bioinformatics.